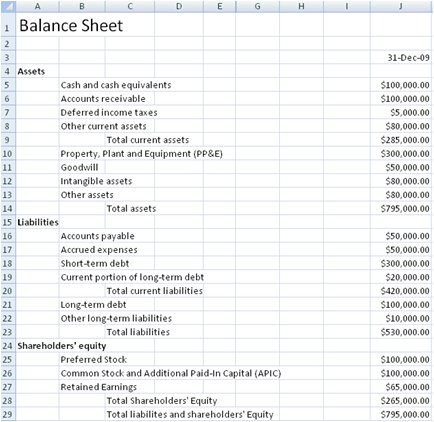 In financial accounting, a balance sheet summarizes an organization's financial position at a specific point in time. It is one of the four financial statements often referred to as accounts. The balance sheet shows the assets, liabilities and equity of the organization and expresses the following formula in a document to help people understand the business quickly and easily. Assets - Items of value owned by a company. The items can be tangible physical items or intangible items. Assets can be further grouped into current and non-current. Current assets are those that can be readily converted to cash. Liabilities - Obligations like a debt to another party or company. Liabilities can be further grouped into current and non-current. Current liabilities are those that have to be paid off with a short time. Equity - Owner's value or net worth. It is the money invested in the company. This set of balance sheet spreadsheet templates is designed for use by financial analysts in financial modeling. It includes both simple templates and slightly more complex and formatted templates. Reusing them is simply a matter of copy and paste. 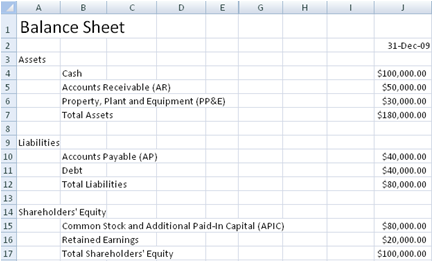 Many of the financial models created by ConnectCode use these balance sheet templates as a basis.